Note to journalists: Please report that this research is being presented at a meeting of the American Chemical Society. A press conference on this topic will be held Monday, Aug. 22, at 2:30 p.m. Eastern time in the Pennsylvania Convention Center. Reporters may check in at Room 307 in person, or watch live on YouTube http://bit.ly/ACSlivephiladelphia. To ask questions online, sign in with a Google account. PHILADELPHIA, Aug. 21, 2016 — Most people start racking up scars from an early age with scraped knees and elbows. While many of these fade over time, more severe types such as keloids and scars from burns are largely untreatable. These types of scars are associated with permanent functional loss and, in severe cases, carry the stigma of disfigurement. Now scientists are developing new compounds that could stop scars from forming in the first place. The researchers are presenting their work today at the 252nd National Meeting & Exposition of the American Chemical Society (ACS). ACS, the world’s largest scientific society, is holding the meeting here through Thursday. It features more than 9,000 presentations on a wide range of science topics. Burns lead to the hospitalization of tens of thousands of people in America every year, according to the American Burn Association. About 250,000 U.S. patients undergo surgical treatment annually for keloids, which are firm, overgrown scars, and for other types of excessive scarring, Iyer says. And a survey by RTI International found that an estimated 7 percent of Americans have Dupuytren contracture, a hand condition that develops when the connective tissue under the palm’s skin contracts and toughens over time. To help prevent such conditions, Iyer and colleagues at The University of Western Australia, Fiona Wood Foundation and Royal Perth Hospital Burns Unit, together with Pharmaxis Ltd., (all in Australia) are studying compounds that inhibit an enzyme called lysyl oxidase, or LOX. During scar formation, this enzyme enables the collagen involved in wound healing to crosslink. This bonding underpins the fundamental biochemical process leading to scar formation, Iyer says. The team tested their molecules using a “Scar-in-a-jar” model, which mimics scar formation. In short, this technique involved culturing human fibroblasts from scar tissues in a petri dish. The cells overproduce and secrete collagen, as they would in a real injury. In the study, the researchers added LOX inhibitors to cultures from patients with Dupuytren’s, keloids and other scar tissue, and detected changes using two-photon microscopy combined with biochemical and immunohistochemical analyses. The researchers’ primary objective is to help patients with severe or extensive scarring, but Iyer says that the inhibitors could potentially be used for cosmetic purposes as well. Iyer acknowledges funding from the Australian National Health and Medical Research Council, Australian Research Council, The University of Western Australia and Pharmaxis Ltd. The American Chemical Society is a nonprofit organization chartered by the U.S. Congress. With nearly 157,000 members, ACS is the world’s largest scientific society and a global leader in providing access to chemistry-related research through its multiple databases, peer-reviewed journals and scientific conferences. Its main offices are in Washington, D.C., and Columbus, Ohio. 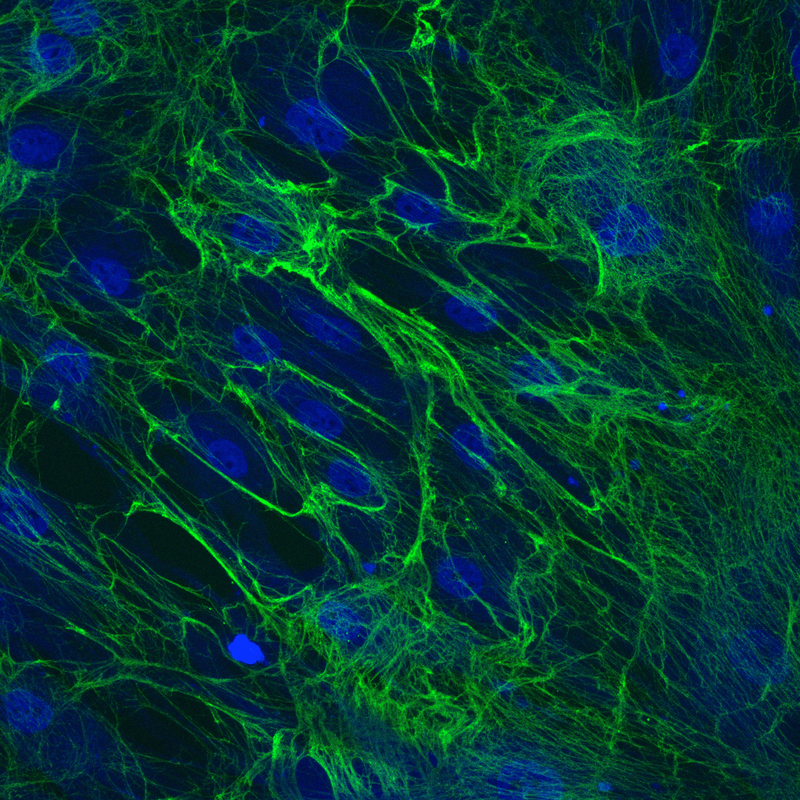 During the natural scarring process, collagen proteins (green) in fibroblasts from a Dupuytren patient crosslink together.